Eva Laursen Bechtold was born July 26, 1926 in Dagmar, Montana and passed away at her home in Denver, Colorado on November 30, 2018 at the age of 92. Eva grew up on a farm in Montana and completed her early schooling in Dagmar, Antelope, and Medicine Lake. She graduated from Northern Montana College in 1946 with an Associate’s Degree as a medical secretary. 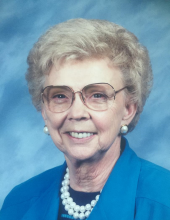 Eva then moved to Denver and, in 1947, she received her Certificate in Laboratory Technology from Denver General Hospital and began work as a laboratory technician. It was while working at Denver General Hospital that she met Joe Bechtold MD. Eva converted to Catholicism and they married in 1949. Joe, Eva, and their seven children were active in Blessed Sacrament Parish until Joe’s death in 1976. Eva subsequently became a faithful member of the Church of the Risen Christ Parish. Eva also found a career working in Financial Aid at the University of Denver. She remained a part of the DU family until her retirement in 2001. Eva was a vibrant, intelligent woman who always placed faith, family, and friends first. She was a great cook and loved entertaining. Eva also enjoyed tennis, downhill skiing, bridge, gardening, walking, and attending bible studies. In later years, she enjoyed walking or wheeling around her neighborhood and sitting on her patio appreciating nature . . . flowers, trees, birds, rabbits, and squirrels. Eva was preceded in death by her husband, Joseph H. Bechtold, Jr MD; her firstborn, Joseph H. Bechtold III; her son-in-law, Bill Cumings; her special friend, Jim Kerr; her parents, Gonius and Astrid Laursen; and her siblings Gussie Sepulveda, Thora, Carl, and Aage. Eva is survived by her children: Karen (Dave) Harberson, Anne Cumings, Peggy (John) Riskorski, Michael, Paul (Suzy Nicholson), Kay (Clint) Scott, and Amy. She is also survived by her grandchildren: Alyssa and Troy (Meli Alarcon) Harberson, Julie Cumings, Kali (Nko Dlodlo) and Emily Bechtold, and Rachel and Paul Scott, and all those who adopted her as grandma Eva. She is further survived by her niece and nephews: Reg, Leota, and Carlton Laursen, and Jim and Bob Sepulveda. Eva will be greatly missed. Her legacy lives on in the hearts of those fortunate enough to have known her. Her family would like to express special appreciation to Diane Larson, Denver Hospice (especially CNA Carol Richardson), and Project Angel Heart. The date and time of her funeral service will be announced in the new year. Memorial donations may be made to St Labre Indian School, PO Box 216, Ashland, MT 59003 and Project Angel Heart, 4950 Washington St, Denver, CO 80216-2026. To send flowers or a remembrance gift to the family of Eva Marie Bechtold, please visit our Tribute Store. "Email Address" would like to share the life celebration of Eva Marie Bechtold. Click on the "link" to go to share a favorite memory or leave a condolence message for the family.